Being a self employed dressmaker is cool and bohemian, but it palls in comparison to being a professional musician because I don’t get to carry an instrument case around. I finished the corset! Yes I did. 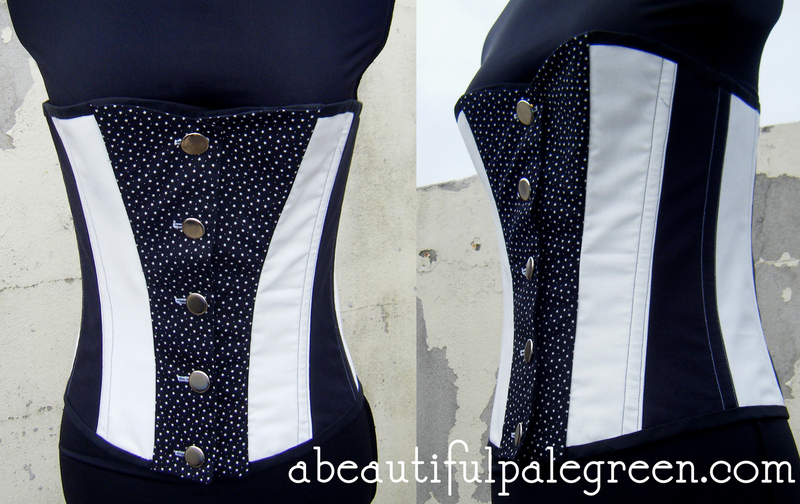 Corsetcorsetcorset. It took a long time. It fought back. I had to redo one particular seam SIX TIMES. To be honest, it’s pretty far from perfect, but it’s DONE. To qualify the above, I’m not terribly experienced with corsets anyway, and that, coupled with the fact that this was the first iteration of a new design, made for some… fraught moments. In addition, about half way through the first half, I worked out a WAY better way of doing things, but I couldn’t really undo everything I’d done, so I had to keep making the rest in the old way. Rest assured that when I make these to order, I’ll be using the new way. Because New Is Always Better. Here is a picture. A few things still need adjusting about it, and next time I’ll cut the fly at the front differently. I’ll get it up on Etsy for made to measure sales as soon as I work out a price and get some decent pictures of it. One of the reasons I was delayed in making the corset was that on Monday evening, I got an enquiry on Etsy about the Harlequin Waistcoat. Due to a wardrobe emergency, could I make one up (my made to measure stuff is made completely from scratch- I draft the pattern from your measurements, cut the fabric accordingly, and put the whole lot together) to be delivered on Thursday? Given that I was at a friend’s on Monday evening, that meant two days to draft, make, and ship it. I do like a challenge! Anyway, I put everything on hold, starting tuesday morning, and got it in the post, next day guaranteed delivery, on Wednesday lunchtime. Mission: Success! So if you’re ever thinking, “Hmmm, I like it, but I doubt he could make it in time…”, I probably CAN make it in time, so try me! Unless I have a vast amount on, I won’t charge extra for a rush order. I post new designs and progress on orders and ideas in those places, so keep an eye on them! This entry was posted on Friday, September 28th, 2012 at 8:55 pm	and is filed under circus swing, corset, sewing. You can follow any responses to this entry through the RSS 2.0 feed. You can leave a response, or trackback from your own site.